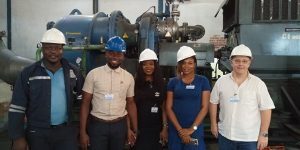 In February 2019, representatives of Ingersoll Rand (IR), visited BOG offices in Lagos and Port Harcourt to train members of the Business Development (BD) and Rotating Equipment (RE) teams. This visit is to steer BOG towards achieving its goals. IR is a diversified industrial manufacturer of compressor systems, power tools, ARO pumps and lifting and material handling equipment. BOG is the Channel Partner of IR in Nigeria, representing IR’s diverse products and solutions. This mutually beneficial relationship has spanned many years. Representatives of IR, Etienne Hureaux, Regional Manager for North French and West Africa (NFWA); Philippe Thomann, Service and Aftermarket Manager NFWA; and Michel Cure, Regional Technical Lead, NFWA had training sessions with the BD and RE Teams in BOG both in our Lagos and Port Harcourt offices. The training was centered on general sales, knowledge of IR and its products. On general sales, participants were guided through modern intelligence gathering techniques such as asking smart questions, while the details of new product lines were also explained. Engaging clients with the right terminologies was emphasized as critical to successful engagement of prospective clients. The training ended with a roadshow at Air Liquide Nigeria for a hands-on session on centax compressor. While in Lagos, the IR representatives and members of BOG’s BD Team, went on a client visit to Delta Afrik Engineering to engage the end users and give clarifications on recent and upcoming deliveries. In Port Harcourt, the IR representatives and members of BOG BD Team visited Haliburton Energy to clarify technical queries on IR air compressor. The visit was fruitful, as some of the issues raised were resolved. Representatives of Ingersoll Rand (IR) and members of BOG Rotating Equipment (RE) and Buisness Development (BD) Teams during a session at BOG’s Port Harcourt office. From right: Philippe Thomann, Service and Aftermarket Manager, North French and West Africa (NFWA), Ingersoll Rand; Maureen Davis-Nnedu, BOG; Maureen Amadi, BOG; Michael Dakor, BOG; and a Richard Ouedraogo, a Technical Manager at Air Liquide Nigeria, during a recent roadshow.